I am in Edinburgh for most of the festive period, but blogging may be fairly light from today! If any constituents, colleagues or other contacts really do need to speak to me - then the mobile would be the surest way to track me down. 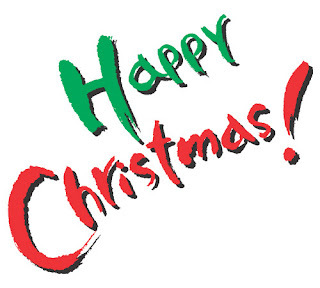 Very best wishes for Christmas. ... and today, the EIS has an equally damning Release about the core number of employed teachers in the country. 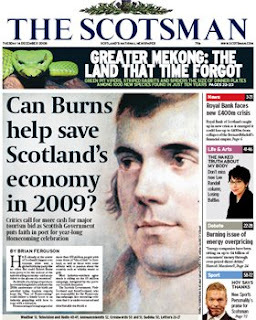 Scotsman has run with the story this morning. Frankly, all the main school-based, education commitments of the SNP at Holyrood have been a busted-flush for quite some time - this is just yet more proof-positive of that fact. ... no particular celebrations today - the weekend visit to Glasgow was my early birthday present! ... bit of a treat for the big day tomorrow! Batteries definitely re-charged and now ready for a few more days at work before the madness of the Christmas holiday really begins. Many thanks due to all the Group Staff who put in a huge amount of work to make sure the evening went smoothly. Anyhow, one of the significant moments - for me - of the day was an acceptance that traffic management arrangements are the responsibility of THE COUNCIL and not of any arms-length body or external entity ... pleased to see that the local paper reported this almost verbatim today - see the third-last paragraph. "Councillor Dawe also told the full council meeting that she, transport leader Phil Wheeler, the council's chief executive Tom Aitchison and the city development director Dave Anderson would all take collective responsibility if there was a repeat of the chaos experienced during The Mound closure when work gets under way on Princes Street next year." ... mind you, hopefully it won't be as long a meeting as last month? "delegates authority to me, in consultation with the Council Leader and Depute Leader, to put in place revised arrangements for communications activity"
... yes, you've got it - that is asking for the Council Chief Executive to have delegated authority to finalise communications activity for the tram project in consultation with the Council Leader (fair enough - she wants the trams) along with the Council Deputy Leader; who last time I checked wanted to cancel the whole tram project! ... but allowing oversight of tram communications to an opponent of the tram project - errr, one has to wonder why this has even made it into any set of proposed recommendations? I wonder if the Council Leader has even really thought this one through properly? If this is approved, does she think the Council Deputy Leader will play a constructive role in this communications activity?? I blogged about all of this nearly a year-and-a-half ago ... see here ... if you follow the link within that post, you'll see that the Transport Minister said back then that a new "10-year road safety strategy" would be developed? I was willing to give him the benefit of the doubt at the time. But he's now saying it will be launched in the New Year ... really, 2-years to develop a 10-year road safety strategy?? As the eternal-optimist, I don't really subscribe to the view that 'its a bad time to be a politician' ... political scepticism may be rampant, but I for one reckon its been just so for generation upon generation. And, personally, I reckon such scepticism is no bad thing. If you believe that politics does changes lives, then you surely have to believe that its right and proper for those very changes to be rigorously questioned, challenged and debated? "All of us know the problems that are rooted in our addiction to foreign oil. It constrains our economy, shifts wealth to hostile regimes and leaves us dependent on unstable regions." That's the next democratically elected President of the United States speaking earlier today. Certainly strikes me as a bit of a change from that countries' previous position on oil dependency? I know that words are easy, and actions are what matter, but as I've mentioned before I do think that the world is in for a bit of a shock following that inauguration on the 20th January 2009. Remember the outcry (earlier this summer) over the SNP/Lib-Dem Administration's removal of a whole range of hot school meals from the city's educational establishments? Guess what ... at this Thursday's Council meeting they are reversing the vast bulk of the decisions. Have a quick look at this report. 6-months late ... should never have happened in the first place ... but well done them. ... the Policy and Strategy report (which I mentioned earlier) is now coming up to the Full Council meeting this Thursday. The relevant documentation can be found here. There are a lot of deputations on this issue, and I believe there may well be a considerable public presence at the City Chambers given the strength of feeling about all of this in North Edinburgh. I still cannot understand why the current Administration just won't back the adjusted motion/amendment - have a look here again? ... if they did so on Thursday, I'd applaud them. ... so, on a much more serious note - regular readers will know I'm no huge fan of TV but do have a bit of a weakness when it comes to ER and Spooks. Sadly, neither is currently on terrestrial television - which is all the Burns household has access to! ... tragically, it was the last episode tonight. I hope someone at BBC Scotland has already had the good sense to commission more episodes? ... well, there's been a bit of external consultancy work finished recently for the ERS, which had recommended quite a significant change to the organisations' Council 'officer posts'. New structure, in effect, to tackle new challenges. The principles of all of this were accepted by the current officer-bearers, and wider-Council body, back in late August. Thus, this latest quarterly Council meeting has duly seen the election of a new set of such officer-bearers, with the current Chair standing down after some 5-years in post. ... and yes, yours truly has been elected as Chair! I therefore sense a bit more time being spent in London over the coming months - my no-flying regime could be about to be severely tested? I well remember the endless arguments, in Edinburgh, back in 2003-2005 about how all the city needed was 'trams first' and then congestion charging would make perfect sense and would have received widespread public support ... I know its hard to believe now, but THAT IS exactly what was being said at the time. ... well, the news from Greater Manchester today seems to disprove that theory unfortunately: 78.8% No to 21.2% Yes ... and the region has had a tram system for years. ... even more resounding than that 22nd February 2005 result in Edinburgh: 74.4% No to 25.6% Yes. Very difficult to see any other UK-city taking forward such proposals now? Electoral Reform Society (ERS) Council meeting in London this Saturday ... off down to the metropolis later today, and not back up until early Sunday evening. 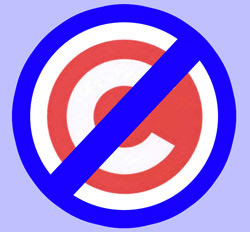 Blogging may thus be a bit light over the next couple of days ... but do look out for those December Council papers (actual meeting is on Thursday 18th), which should be up on "Committee Papers On-Line" (CPOL) around 10am this Friday. ... more to follow early next week, for sure, on many of those reports! 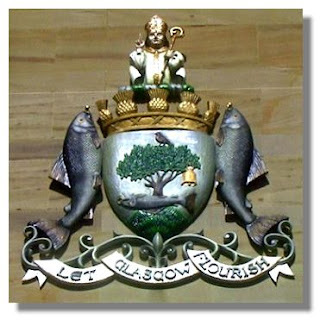 Attended Tollcross Community Council this evening ... was the only elected-Member present, which is an extremely rare occurrence in these multi-member Ward days! Well, the day just gets worse and worse for Edinburgh ... massive problem with the successful employment of newly qualified teachers; trams for Glasgow, and now the school building programme has ground to a virtual halt. Late this afternoon, the SNP/Lib-Dem Council Administration frankly confirmed their complete inability to match Labour's previous school-building programme "brick-for-brick". Between 1999 and 2006 (a 7-year period) the previous Labour Administration in Edinburgh commissioned a total of 34 new or refurbished schools (all listed here). This has resulted in one-third of the pupils attending Edinburgh's schools learning in buildings that are either new or completely refurbished. Its a statistic that is unparallelled anywhere else in the country. And today we've had it confirmed that - maybe - 1 school, Portobello High School, could be renewed by 2014. The other four Wave3 Schools are now confirmed as having no associated funding to take their renewal or redevelopment forward. Its a complete disgrace. James Gillespies High School, Boroughmuir High School, St. John's Primary School, and St. Crispin's Special School, are all being told they will simply have to wait. The result? - between 2007 and 2014 (a 7-year period) the SNP/Lib-Dem Administration in Edinburgh will have commissioned - maybe - the grand total of 1 new or refurbished school. Just to remind you - here's what the SNP manifesto said in May 2007: "we will match the current school building programme brick for brick." It was a cruel deception and the Minister for Education should hang her head in shame. Just a couple of days ago, I mentioned the likely failure of the Scottish Futures Trust to ride-to-the-rescue of a replacement Forth crossing as part of the wider "Strategic Transport Projects Review" ... and indeed it hasn't. But not in my wildest dreams did I expect SNP support for trams in Glasgow. You could not make it up. "Holyrood ministers have approached the Treasury about increasing the capital budget to fund the new crossing while it was being paid for, with a reduction in later years. However, the Scottish Government has yet to receive an answer." The General Teaching Council (GTC) of Scotland has a pretty damning News Release on its website today ... I'm amazed it hasn't picked up more press attention? The statistics within the research clearly show that - compared to last year - 'employed probationary teachers' are down nearly 9 per cent, 'secondary teachers in permanent posts' are down almost 13 per cent and the overall proportion of teachers on supply lists has increased from 18.7 per cent to over 30 per cent. Not a pleasant picture for newly qualified teachers. ... the North Edinburgh News (NEN) has all the gruesome details in its December edition - here. ... that said, I've seen no further press coverage of its contents this afternoon and cannot track down an electronic copy? I do think it could make for interesting reading tomorrow (presuming it will actually become publicly available?) 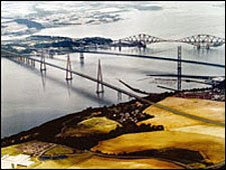 as to whether the proposed new crossing over the Forth will be 'additional' - but, more importantly for me, just how on earth its all going to be paid for? ... would love to be wrong. Took the visitors over to the Botanic Gardens today ... loads of good events on for the kids, who all had a great time. And, I must commend an exhibition called "Close" that is running until the 11th January 2009 ... really excellent garden photography from all over Scotland. Thought it was so good, we even bought the accompanying exhibition-book from the Botanics shop. ... from the exhibition, learned that there's a new roof-garden at New Lanark, which looked particularly spectacular. 'Christmas run-up' felt like it started properly today, with the first batch of pre-Christmas visitors to stay at the flat over the weekend. ... two other boys as part of the visiting-party, so Junior thoroughly enjoyed the ensuing chaos! ... very good document; an enjoyable presentation (on the findings); followed by a lively discussion about the pros and cons of STV-PR from the perspective of the communities that have now been living with it for 18-months. ... if what he says is true, and if I've interpreted it correctly, the Metropolitan Police raided an MP's office without a search warrant and failed to tell the responsible officer (the Serjeant at Arms) - as they have a requirement to do so - that she was not obliged to allow access or that she could insist on seeing a warrant (which, of course, they didn't have!). My personal conclusion - totally shocking Police conduct, and equally shocking knowledge of procedures by the responsible House of Commons officers. ... well, coffee was provided - along with some biscuits, whose sell-by date was 1st November 2008! The fact that it doesn't add up at this stage of the process (budget not actually set until February 2009) is no great surprise, but the pressures and statistics look very familiar to those of last year. No 'bright new future' here I'm afraid. ... but in a moment of non-partisan weakness, I can't help wondering why the SNP Government doesn't just abandon the Scottish Futures Trust and do something similar to what the Welsh Government announced earlier today? ... in February 2008, when the Council set its 2008/09 budget, the Labour Group opposed the then 1.5% cut in devolved school budgets and moved an alternative (and competently funded) position of zero reduction. That position was unfortunately defeated in the subsequent debate, and vote, when the Lib-Dem/SNP Administration pressed ahead with a 1.5% cut. Next February (2009), when the Council sets its 2009/10 budget, it will again be our absolute intention to oppose any reduction whatsoever in devolved school budgets - and we will certainly oppose any suggestion of a 2% cut. Its also worth mentioning that in the last 8-years of our Administration (from 1999-2007) we protected school-based budgets from any reductions in all but 1 of those years. It can be done. Policy and Strategy Committee this morning - agenda can be found here. ... no where else in the City is having these problems - that's not to say everything is sweetness and light, far from it - but at least the transition has been far better managed. I'm certain that after the powerful deputations that accompanied this motion today, even those in power must know privately that something has gone badly wrong in North Edinburgh with the FSF. BUT - stubbornness, and politics probably, prevented any compromise on my motion which was defeated by an amendment saying all was fine. The whole topic now goes up to Full Council on the 18th December ... if the current Lib-Dem/SNP Council Administration backed-down on this, I'd applaud their good common sense in realising that this part of North Edinburgh needs much more 'transitional' assistance. The other main topic, of more limited discussion, was the report at Item 10 on the agenda ... you can see it here. I've already mentioned the positive press coverage of this report, and indeed my ongoing worries about the accuracy of street-cleanliness measurement! Anyhow, it does need to be mentioned that this report actually covers three years of positive progress across a variety of service delivery areas of the Council ... 2005/06, 2006/07 and 2007/08. ... you know what's coming next - of course, Labour were in control during those first two years, but we also set the budget for the third year. That budget was set in February 2007 and ran through until April 2008, with the Libs/Nats being in charge from May 2007 obviously. Remember all that Lib/Nat blind-panic over the budget they inherited, yet somehow they now seem delighted with the performance improvement that it was the foundation of? They need to read Aesop's fables ... especially that one about the wolf. ... looks like a thoroughly good scheme to me - so do follow those links if you're interested?